Well the short break of not traveling is over. Over the next 3 months ill be seeing the Hampton Inn more than my home. Tomorrow I leave for Chicago for a short trip to cover the D1 event at Soldier Field. After that I will be headed out to Seattle, WA; Sonoma, CA; Winnipeg Canada; Calgary, Canada; Toronto, Canada; Miami, FL, Dallas, TX. Somewhere i will find the time to take a few days off and go to Tokyo, Japan for a few days to visit friends. This was a good week. One of the benefits of doing photoshoots for European Car Magazine is that from time to time they hand me the keys to one of their long their long term vehicles. This week it was a white Audi A5 3.2 Quattro. I have driven this car before and what a dream it is to drive. The car is so quiet and a lot of fun to drive. it seems its sweet spot is cruising at 90 mph. This is a very subtle car but gets a lot of looks from pretty much everybody. With a lot of cars you either get attention from either women or men but this Audi get looks from every one. I’ve been pretty slammed lately with photoshoots for Mini-Truckin, Import Tuner, Super Street, Heavy Hitters magazine, Honda Tuning Magazine and European Car. I still need to put up some galleries once i upgrade to a better template. So here are just a few recent shoots. There is Alex with his pair of Nissan Skylines in downtown LA, Ken Block at his Gymkhana practice with his Subaru, Marie Kim from PM girls and a drifting 350Z from JE Performance shot in Baltimore, MD. Does recycling make a difference? Recently one of my friends made a comment on Facebook about what is the point of recycling when you get such a little amount of money from it, its hardly worth the effort. I started recycling when I bought my house 10 years ago. I recycle anything I can get money for. Even if it is just a few cents, at least I am getting something. I bought some very inexpensive trash cans 8 to be exact. I recycle aluminum cans, plastic bottles, glass bottles, newspaper, white printer paper, and all the shredded junk mail. In addition to the household recycling I also do a variety of metals. By owning a house it is amazing on how much of other metals that cross your path wheather its replacing faucets (brass), door knobs (brass), aluminum over some time it really adds up and once i have enough to fill my truck i go to the recycling center. Over the last 10 years i have recycled 15,989 pounds and received $846.48 for my efforts. This is supposed to be a fairly easy trip. Originally just going to Las Vegas, NV to photograph Formula D qualifying on Friday and the top 32 event the Saturday then go home. Two days before I was supposed to leave, I get a call from my Editor at Super Street Magazine asking me if I can “squeeze in” one more shoot on Thursday afternoon, Miss Formula D Miki Taka at the track then shoot a blackjack tournament that night. Now instead of traveling lite with just my basic gear and a Canon 300 2.8 that I rented from Calumet. I now had to photograph Miki Taka Miss Formula D to shoot outdoors at a racetrack with no power and not clear plan on how and where I was going to photograph her. Now I have to bring a lot of gear because i’m not sure of the situation I will be shooting. I would have liked to shoot her on the racing circuit but the only problem was that practice was going to start around the same time I was supposed to start shooting. What to do. With my job you can do all the planning and thought into a shoot but most of the time its go to plan B and improvise. So i saw their starting lights and decided to go to a clear area of the parking lot and setup the light, then talked to my good friend Jonathan at Falken Tires to help me get one of their sponsored cars to use in the background which was a challenge since there was practice going on, but luckily it didn’t take too much convincing once they realized a model would be in front of their car. Once Miki arrived we didn’t have much time to shoot because the light was going away fast. She was wonderful to work with even though it was over 100 degrees and the wind was blowing Miki had a great attitude and great personality. I hope i get a chance to work with her again when we have more time to shoot. Anyway all the images came out great and the editor loved them. Friday and Saturday were qualifying and race day. The event started later in the afternoon but it was still over 100 degrees both days. For me Friday was a pretty miserable day. I woke up at 6 am really sick, i won’t go into the details but it was a rough day. Once thing about being a photographer, you just have to work through those situations and get the job done. My editor can’t fill pages with excuses. I just moved a bit slower shot all day till about 11pm then I had it and went back to the room at the luxurious Hampton Inn to rest for the next day. 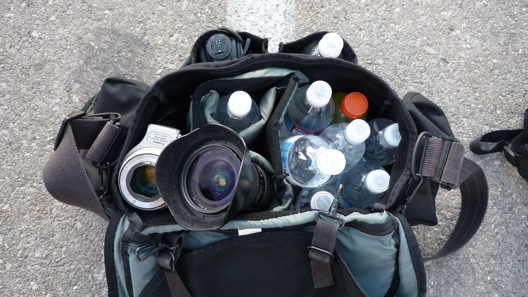 Practice was like any other except insanely hot and it is worse carrying around 30 pounds of camera gear the whole day. I am just thankful the media center and Falken were there with cold drinks. During the practice Vaughn Gitten driving the Ford Mustang hit the wall and ripped off the front suspension and wheel from the car. The caliper and strut were still attached to the HRE wheel. A couple hours later when I went to the Falken pit, I was amazed that the car was put back together and ready for qualifying. That took an amazing amount of effort to get it back together. 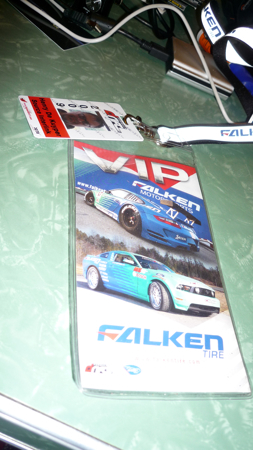 A big thank you goes to Nick at Falken Motorsports, for giving me a VIP pass to their hospitality area. This is always a great place to get out of the sun, sit get something to drink and get lunch and dinner and see colleagues and friends. I was surprised to see Mike Kojima wearing Falken colors, I guess he is helping with some of their chassis tuning. Saturday, felt a lot better. Just took it easy in the room getting caught up on work. I have been shooting so much lately haven’t had time to edit. The event was the same, cars going sideways, choking tire smoke and heat. In the end Tanner Foust took top honors in the twin drifting competition and won the Formula D Las Vegas.